The Invacare Bariatric Cane is built with durable steel construction that provides maximum stability for individuals weighing up to 700 lbs. The cane's height adjustment features ensures an individualized fit and and is designed with a twist locking ring providing additional security during height adjustment. 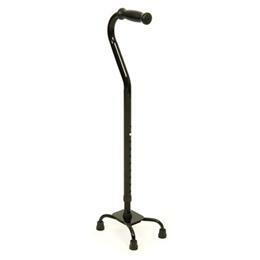 Features: Small-base footprint provides additional stability and walking assistance versus a standard cane Strong and durable steel construction Large client height adjustability range Bariatric weight capacity up to 700 lbs.